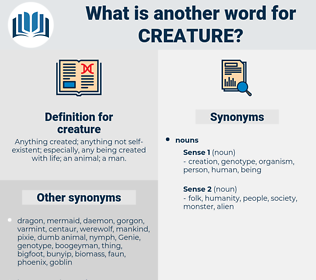 What is another word for creature? Anything created; anything not self- existent; especially, any being created with life; an animal; a man. 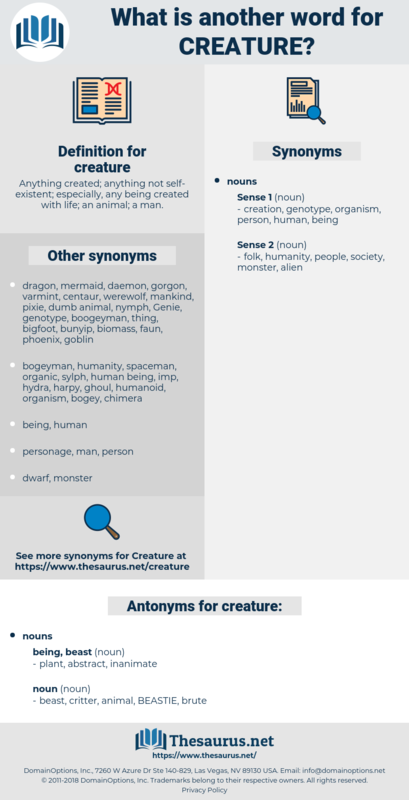 beast, critter, animal, BEASTIE, brute. At the slightest sound from the baby, the father was on his feet to see what the innocent creature needed. I am a poor creature, Dorothy, but I love you as my own soul. charadrii, chokecherry tree, credit hour, certiorari, charioteer, curator, carter, courtier, creator, car door, cherry tree, cartier, charter, charity throw, checkered adder, critter, creditor, crater, cortaderia, corridor, car tire, corduroy.